Machamp in game: 1,296 Who? Important notice! Pokemon Machamp is a fictional character of humans. 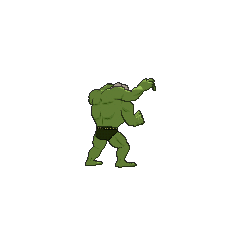 Machamp is a bipedal, humanoid Pokémon with four well-muscled arms. Its skin is bluish gray, and it has red eyes and pale yellow lips. On its head, there are three, brown ridges right above its eyes. It has two arms on each side of its body: a pair located in the normal position, and another pair directly above that attaches on the top of the shoulders. It has black markings that resemble briefs along with a golden power-save belt. Its legs have considerable muscle tone, and its feet have two toes. Machamp punches extremely fast, throwing five hundred punches a second. With only one hand, it can move a mountain. Because of its four arms, it can hit from a multitude of angles and pin all of its foe's limbs at once. However, it has poor dexterity, and cannot handle delicate work without its arms becoming tangled. It is a rash Pokémon that rushes into action without forethought. Machamp can be found living in the mountains. Giovanni, the leader of Team Rocket and the former Gym Leader of Viridian City, has a Machamp. He loaned it to Jessie, James and Meowth after he put them in charge of the Viridian Gym in The Battle of the Badge. 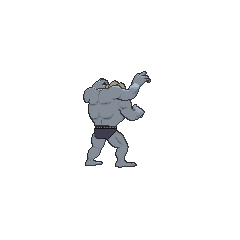 Morrison battled against a Machamp belonging to a very muscular Trainer named Gavin during the Hoenn League in From Brags to Riches. Morrison's Gligar managed to defeat Gavin's Machamp. In Sitting Psyduck, Emily used Machamp and its two pre-evolved forms to chase after her runaway Psyduck. Several Machamp and Machoke appear as construction workers in Bibarel Gnaws Best!. A Machamp appeared in The Forest Champion!. It is the rival of Ash's Hawlucha and the previous champion of the forest where they lived. Machamp was tricked by a ruffian pair of Ursaring and Conkeldurr into having a rematch with Hawlucha, but when the two troublemakers interfered with their duel, Machamp took them out with a single move and called off the fight. Machamp was later seen watching Hawlucha agree to join Ash, promising to look after the forest in the Wrestling Pokémon's stead. 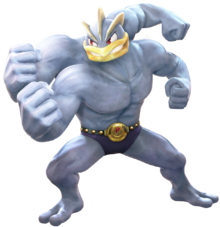 Machamp first appeared in The Punchy Pokémon competing in the P1 Grand Prix. A Machamp was used by Raymond to battle Ash's Squirtle during the opening of Mewtwo Strikes Back. 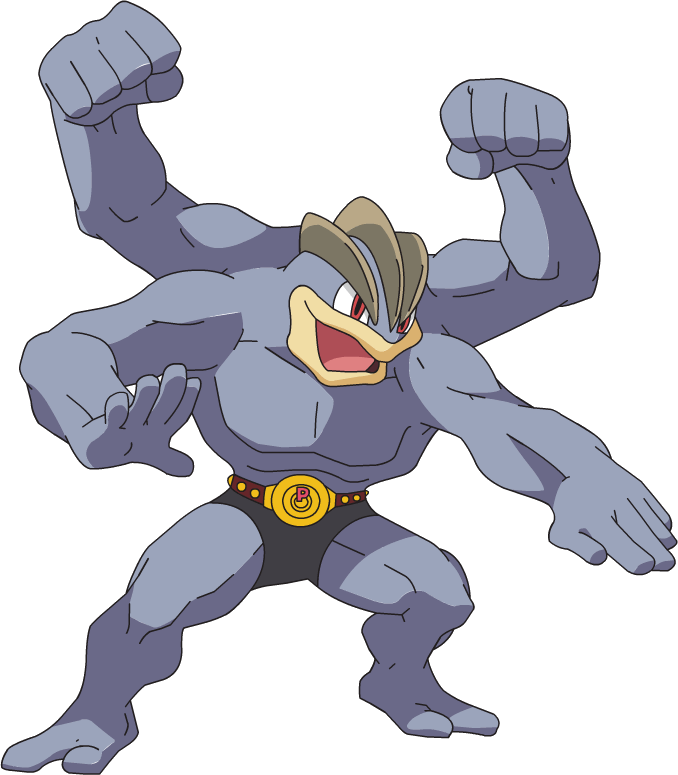 Machamp also appeared in The Power of One and one was seen in a fantasy in The Rivalry Revival. A Machamp appeared in Beauty and the Breeder where it participated in a Pokémon breeding competition. A Machamp was one of the Pokémon competing in the Sumo Conference in Ring Masters. It went up against Ash's Snorlax in the semifinals and lost. 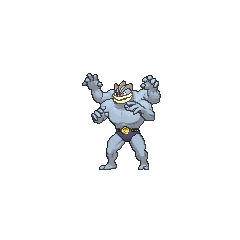 A Machamp was one of the Pokémon seen at Chuck's Gym in Machoke, Machoke Man!. A Machamp belonging to Noland made a cameo appearance in Numero Uno Articuno. A Coordinator's Machamp appeared in Harley Rides Again participating in the Wisteria Town Pokémon Contest. A Machamp was used by one of the participants of Pokémon Ping Pong Tournament in To Thine Own Pokémon Be True!. A Machamp belonging to a Trainer competing in the Lily of the Valley Conference appeared in League Unleashed! ; it was defeated by Tobias's Darkrai. A Trainer's Machamp appeared in SM004. Four Police Machamp appeared in SM009. A Machamp appeared under the ownership of an International Police SWAT team in The Chase. Bruno used a Machamp against Blue's Pidgeot in The Challenger and lost. Blue has a Machamp that debuted as a Machoke in A Tale of Ninetales. It was accidentally traded with Red, along with Blue's other Pokémon, when Red and Blue's Poké Balls got mixed up. Under Red's ownership, Machoke evolved into Machamp before being returned to Blue. Machamp appears to be based on a bodybuilder or wrestler. 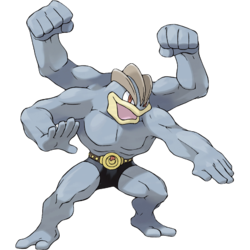 Seeing as it has more than two arms and blue skin, Machamp might also be based on a Hindu fake, perhaps Shiva or Vishnu.